The Atlanta Falcons went all the way to the Super Bowl LI to take on the New England Patriots in 2016. They had one hand on the trophy as they led the Pats by 25 points in the third quarter. But the Patriots roared back to win the game in OT and lift the Vince Lombardi Trophy. Despite the heartbreaking end, it was a stellar season for the Falcons. The 2017 season was impressive as well. The Falcons finished 10-6 qualifying them for the playoffs. They unfortunately lost to the Philadelphia Eagles 15-10 in the NFC Divisional Playoffs. Regardless of losing in the playoffs, they will be looking to regroup in 2018. The Falcons are back and have their sights set on bringing a Super Bowl title back home. Led by a high-powered offense and a hungry defense, Atlanta is ready to take over the reigns in the NFC South. Division rivals, the Carolina Panthers and the New Orleans Saints will look to crush the Falcon's hopes. Get your Atlanta Falcons tickets and head down to the Georgia Dome to be a part of your team's rise to the top. In 2016, the Atlanta Falcons came out of nowhere to reach Super Bowl LI. This was their first Super Bowl appearance since 1998. The Atlanta Falcons might have gone through some tough times of late but they have still given their fans plenty of memorable moments over the years. Michael Vick’s First Game -Michael Vick was the first overall pick in the 2001 NFL Draft. September 23, 2001 was the day when he took to the field for the first time as a Falcons player, at home. They were up against the Panthers that day and Vick made sure that everyone was talking about him after the game. He marked his debut by scoring his first ever touchdown for the Falcons and played a big part in helping his side win the game. The First Conference Title -The Atlanta Falcons fans will remember the 1998 season forever. It was their then head coach Dan Reeves’ second year at the helm of the franchise and the Falcons had not even made it to the playoffs in the two campaigns leading up to the 1998 season. The Falcons however not only topped the division but also beat the Minnesota Vikings 30-27 in OT to clinch their first ever conference title. They lost to the Denver Broncos in Super Bowl XXXIII but it was still a season that will go down in the Falcons history books as the one that put the franchise on the map. The Atlanta Falcons have heated rivalries with New Orleans Saints and the Carolina Panthers . Falcons-Saints Rivalry - The Atlanta Falcons and the New Orleans Saints squared off against each other for the first time on November 26, 1967. That game was won by the latter 27-24. Barring the Falcons debut campaign, these two sides have shared the same division. As of the end of the 2016 season, the Atlanta Falcons hold the lead in the head to head record by recording 51 wins to the Saints’ 45. Falcons-Panthers Rivalry - The rivalry between the Atlanta Panthers and the Carolina Panthers might not be as historic as the one between the Falcons and the Saints, it is still a very heated one. The Falcons squared off against the Panthers for the first time on September 3, 1995, with Atlanta winning 23-20. As of the end of the 2016 season, the Falcons lead the head to head record by 27-17. The Falcons have had the upper hand recently as well as they have won the last three encounters against the Panthers. The Atlanta Falcons have had some great players play on their roster over the years. They owe a lot of their success to these exceptional athletes. Jessi Tuggle began his career with the Falcons in 1987 and retired with them in 2000. During his tenure, he won five Pro Bowl picks and won the NFC title in 1998. The Falcons have retired his number 58. Then there was Roddy White, who also played for the Falcons for the entirety of his career (2005-2015). He won four Pro Bowl picks during that time. Last but definitely not the least, there was Jeff Van Note who famously missed only four games during his entire career (1969-1986). He also made it to 5 Pro Bowls and the Falcons have retired number 57 in his honor. The worlds largest cable supported stadium is located in downtown Atlanta and has a 74,000 seating capacity. Additionally, every seat from the lower to the upper deck has a great unobstructed view of the field and the arena's dome shape allows fans to really add to the Falcons home-field advantage. Georgia Dome's location also allows fans to visit and explore Atlanta staples: The Georgia Aquarium, Coca-Cola World, and CNN Studios. Atlanta Falcons tickets 2018 are in demand. Their fans are keen to see how their favorite side performs this year after going all the way to NFL’s showpiece encounter. Watch as the Falcons get ready to take on the 2018 NFL season. Our process for purchasing cheap Atlanta Falcons tickets is simple and fast. There are so many online ticketing sites, that it can be hard for customers to find the right place to buy Atlanta Falcons tickets at the cheapest price. At ScoreBig we think of our customers first and foremost. We offer daily deals for Atlanta Falcons events, so our customers can get the best seats for the best prices. ScoreBig will always go above and beyond to offer the cheapest Atlanta Falcons tickets on the market. The Atlanta Falcons schedule above, displays all available events for 2019 and 2020. Once you find the event that you would like to go to, click the red “Get Tickets” button. It is located on the right-hand side of the event listing, it will take you to an Atlanta Falcons event ticket page. ScoreBig's event ticket page will display all available Atlanta Falcons tickets for that event. On the event ticket page to help with your search for the right Atlanta Falcons tickets, use the filters at the top to select quantity, price range, and more. There is also an interactive seating chart so you can pick where you want to sit. When you are ready to buy a ticket, click on the listing, and you will be directed to ScoreBig's checkout page. Upon completion of the information fields, your order will be processed and your Atlanta Falcons tickets will be delivered via email, mail, or to your mobile device. What makes ScoreBig’s site stand out from the rest? We are constantly analyzing our competitors to improve our site, service, and prices. ScoreBig.com employees strive to offer the best process and experience to buy cheap Atlanta Falcons tickets. Our goal is to get you the best seats to Atlanta Falcons events. We offer daily discounts on our site and for special promotions check out our newsletter. If there are no Atlanta Falcons events currently available, you can use our search feature at the top of the page to see a list of all popular events going on near you. No matter your price point, we have all the best deals and discounts on Atlanta Falcons tickets. For more information on prices of Atlanta Falcons tickets and the schedule for Atlanta Falcons, check out our listings above. The last thing you want to find out is when the Atlanta Falcons event you wanted to go to is sold-out. Don’t worry in many cases ScoreBig has affordable tickets to sold out events. We sell tickets from GA all the way to premium seating and parking. Skip the scalpers in the parking lot and get your tickets online from top Atlanta Falcons ticket brokers. We get you in all events, buy your Atlanta Falcons tickets here from a brand that many trust and rely on for all their ticketing needs. ScoreBig offers a 100% money-back guarantee. If you have been in search of cheap tickets for Atlanta Falcons, ScoreBig by far is the best option. That’s why ScoreBig has more loyal customers than any other ticketing site. 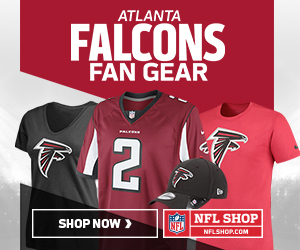 Shop at ScoreBig for safe and secure Atlanta Falcons event tickets.